I don’t know why but we walked a long distance before reaching Gion (祇園) – the place is popular because it is where geisha hang out in Kyoto. We went there in the morning, as you might have expected, there were hardly any geisha around on the street. What you can see at these hours are Japanese tea houses and restaurants. This is where geisha perform while customers are having their dinner at night. It is a misconception to think that geisha are prostitutes. They are not. They are traditional art performers and nothing more than that. 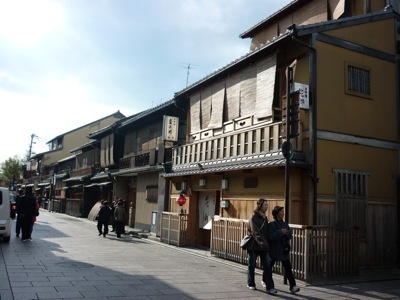 While strolling along Gion street, be mindful of incoming vehicles as the narrow street allows vehicles to ply through. After checking out Gion, we proceeded to a nearby Japanese shrine. I don’t remember the name. In general, there are two main religions in Japan: shinto (神道) and Buddhism. The bus then took us to Kyoto Handicraft Center for buffet lunch. Again another more-than-I-could-eat lunch. Unlike Chinese food, Japanese food is pretty much like Western food as it is served individually. One person one set. Ranging from vegetables to soup, from meat (usually chicken and to a lesser extent pork) to egg. Of course, fish is a must-have in Japanese meals.